Here's an offbeat and hilarious story of voyeurism, obsession, and relationships, both real and imaginary, from the best-selling author of High Maintenance and Going Down. Since she was 13, one of the few things New York novelist Rebekah Kettle has been able to count on is the thrill of seeing a new movie by world-renowned filmmaker Arthur Weeman every fall. Now 33, the humor and poignancy of Weeman's singular movies have inextricably merged with her own memories, to the point that she has begun writing him letters under the guise of her 13-year-old self, and her teenage admiration has become a full-blown obsession. So when Rebekah steps back and takes stock of her life, she isn't happy with what she finds: she's unlucky in love, hopelessly stalled in her work, and unable to get over the past. It's time for Rebekah to take action. She starts a relationship with Isaac Myman, a quirky paparazzo with whom she's suspiciously compatible. And she befriends Mrs. Williams, an eccentric older woman who needs her companionship. It seems things are looking up. But, just as unexpectedly, Rebekah discovers that Mrs. Williams' apartment has the most coveted view on the Upper East Side: straight into Arthur Weeman's town house, where she can watch the object of her obsession's life displayed like a silent movie. Weeman has always been a fixture on the rumor mill, but Rebekah has been his staunchest defender - until she sees the evidence for herself and has to ask herself some questions. Does she give her new love a chance at the scoop of a lifetime, a photo of the compromised Weeman, or does she remain loyal to the man whose films have defined her life? 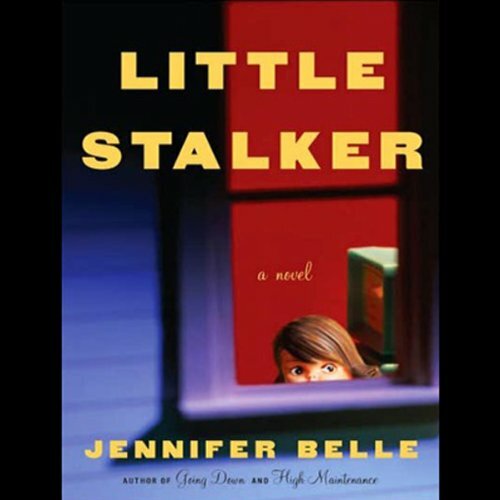 Riotously funny and astonishingly moving, Little Stalker is a bold, daring, twisted, and lovable novel that could have come only from a literary voice as sharp and original as Jennifer Belle's. ©2007 Jennifer Belle (P)2007 Tantor Media Inc. I really enjoyed this book and I. Thought the ending was great. However, I also found it to be a little difficult to follow after sitting it down for a while. Becsides that I think it is the type of book you have to read or listen to yourself. I thought the story was cute, but the main character was a little too neurotic for me. I'm not really a big fan of the Woody Allenish type genre, so that probably had something to do with it. If you are a fan of Woody Allen, this is most likely for you - if you like your "chick lit" a little less oddl, maybe not. The chapter titles were a story of their own and made me smile. Overall I enjoyed the story and its quirky, flawed characters. Just could have done with quite a bit less of the intimate details.